For the past decade, Asia America Symphony director David Benoit has conducted a series of magical, East-West collaborations between his symphony, his trio and Asian guest musicians. The guests have included koto player June Kuramato of Hiroshima, erhu player Karen Hua-Qi Han, who performed on the soundtrack for ‘Memoirs of a Geisha,” the Ahn Trio, for whom Benoit composed “Suite for two trios,” more obvious choices such as jazz saxophonist Sado Watanambe, and less obvious choices such as ukulele player Jake Shimbaukuro. Though the performers rarely have more than a single rehearsal to prepare, Benoit deploys his conducting skills from behind the piano to keep the music tight without cramping the playfulness that the guest musicians seem unable to resist. One characteristic of the collaborations has been that when the scheduled programs end, none of the musicians want to stop playing. Saturday night’s performance at the Norris Pavilion with Benoit’s trio and taiko virtuoso Hiroyuki Hayashida and his trio was no exception. And then, the rugged, athletic Hayashida told the audience he wished to sing “Amazing Grace,” in memory of a friend, and others lost in Japan’s recent earthquake and tsunami. His voice, like his drums, had a deep, martial quality that brought a fitting end to an evening that began with a moment of silence for the Japanese victims. Many in the audience had family and friends in Japan. Benoit, himself, was on the phone with his wife, who was in Tokyo, when the earthquake hit. Asia American Symphony president Ted Tanaka learned of the disaster when his wife called him from the rooftop of a pharmacy in Kesennuma, northwest of the earthquake’s epicenter. The building was surrounded by the surging tsunami. They also lost connection, and Tanaka did not learn for another 36 hours that his wife had been rescued by helicopter. 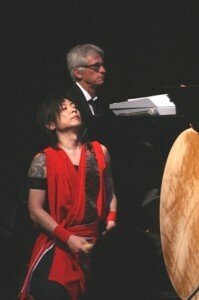 Saturday evening’s performance began with Hayashida performing with fellow taiko drummers Kenmei Kawashima and Chii Koda. Hayashida was formerly a member of Kodo. His trio quickly demonstrated it was capable of the explosive, battlefield sound Kodo is famous for, but the trio also showed the drums’ melodic abilities. Benoit’s trio followed with selections from his new CD “Earth Glow,” Vince Guaraldi’s “Cast your fate to the wind,” and his signature piece “Kei’s Song,” a beautiful, personal tribute to his wife, and musical tribute to Guaraldi, whom he expressed regret at never having met when he introduced the song. 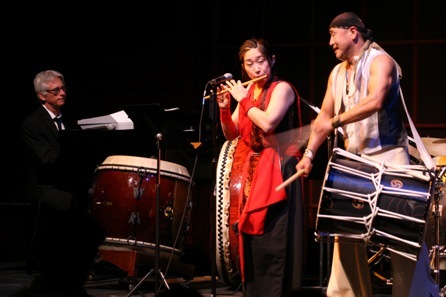 Questions about how, and even if the jazz and taiko trios could match the magic of Benoit’s previous east-west collaborations were erased by Hayashida’s composition “Desert,” which Benoit praised as fittingly titled, even if its composer repeatedly mispronounced its title as dessert. At one point in the evening, while Benoit resolved a technical difficulty with his synthesizer, Hayashida good naturedly entertained the audience with a shaggy dog story that became increasingly humorous because the audience couldn’t understand a word of his broken English. With the synthesizer problem resolved, the two trios performed Benoit’s “Bossa Nova Botswana.” Though Benoit said it was the first time he was aware of a bossa nova beat being supplied by taikos, it wasn’t the drums, but the space age sound of the synthesizer that sounded unconventional. The highlight of the evening was Hayashida’s “Azn Pryd,” an anthem-like composition for flute, played by Chii Koda, and taiko that was more serious and beautiful than its oddly spelled title suggests. Benoit’s next local performance is a slightly less adventurous, but potentially just as enjoyable “Night on Broadway” with the Asia America Youth Orchestra on April 29 at the James Armstrong Theater in Torrance.